This post was originally posted at Austenesque Reviews, but I’m sharing here for my readers to enjoy as well. 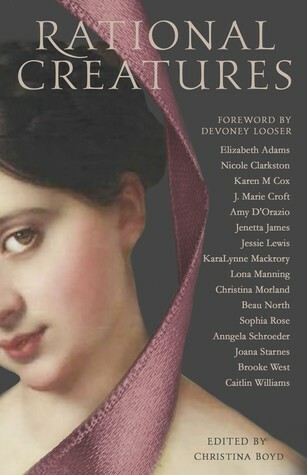 Rational Creatures is a new anthology from the Quill Ink Collective that celebrates Austen’s female characters and explores the ways in which they challenged the social mores of their time. One of Austen’s greatest achievements was creating characters who were all unique and yet each still drawn with great depth and complexity. Courage abides with timidity, servility with pride; indeed, all manner of vices and virtues are to be found intermingled in Austen’s women. Among them, Lady Susan is conspicuously and unrepentantly callous, with very little good to mitigate it. She is a widowed woman in possession of a handsome countenance, in desperate want of a good fortune. In her pursuit of it, she displays no regard for others’ feelings, very little shame and about as much maternal instinct as a chamber pot. All in all, not a woman doing much to advance society’s respect for women. So, when Christina Boyd invited me to write a story for an Austen-inspired feminist anthology, I couldn’t resist the challenge of trying to account for Lady Susan’s journey to becoming the pithy, manipulative coquette we see in the eponymous novel. There is, of course, a darker side to Lady Susan’s behaviour. Though the original story is amusing, told with Austen’s usual flair for wit, the basic premise of a woman fighting to for her place in the world is one common to all Austen’s works. I wanted to keep it light-hearted, though; both in homage to the original and because celebrating womanhood should not be a miserable exercise! With my tongue firmly set in my cheek, I set about exploring why and how Lady Susan might have come to believe the only way to achieve what she wanted was to manipulate everyone into giving it to her—and The Edification of Lady Susan was the result. As fans of Austen will know, the original story is epistolary. I chose to follow suit because letters are a such a wonderful way of revealing intent. A character’s duplicity is easily demonstrated when he or she writes several different letters to several different recipients, each with wholly contrary messages. Though dishonesty is obviously unpardonable, I loved working with Lady Susan’s resolve and ingenuity to whip up a hornet’s nest of deceit, all the while celebrating her cleverness in “getting one over” on all the people (men andwomen) who do to her as she later learns to do to others. For a bit of fun, I thought I’d share one of the plans I laid out to help work out the order of the letters in the story. This being a prequel of sorts, the outcome will be no surprise, so it’s not a spoiler—and hopefully it’ll make you smile to see how Lady Susan’s pithiness permeated even the planning stages of the story. Superb that you have the hots for Lord Doyle. Now hurry up and secure him. Ooh! Flirting? How marvellous! Flirt back and write to tell me about it—I’m so bored! Turns out Lord Doyle was just toying with me. 😒 My brother thinks I should marry his friend Mr Cohen instead. Mother is using you to settle a debt to Lady Doyle! 😱 Luckily you have me to look out for you. Seriously, everyone’s on the take! On top of Mother, Claire and Jennifer, have discovered my brother is using me as well! It’s all going to plan. Susan has your son eating out of her hand. She’s definitely a chip off the old block. Give it a week and they’ll be engaged. Lord Doyle has proposed to me. 🤯 Idiot. It’s ok though, I’ve convinced him Jennifer is better for him. Thanks for the letter. Please pass on the enclosed reply. Sounds a mess, but I have faith in your plan. Shouldn’t be difficult—Claire and Cohen are both simpletons. The Edification of Lady Susan – a short story of scathing wit and ruthless scheming – is my contribution to this collection of poignant and engaging short stories celebrating Austen’s women.